BOEING 737-2B7 Australian National Aviation Museum Moorabbin Airport, Victoria. Forward Fuselage, becomes a display at the Australian National Aviation Museum Moorabbin Airport, Victoria. The delivery of the first 737-277 VH-CZM on June 20 1981 also introduced the new corporate colour scheme to become known as the Shooting Star livery. VH-CZM was put through many training and demonstration flights and entered service on July 1st 1981. The aircraft was well suited to operations in Australia which is why Ansett’s main rival Trans Australian Airways announced on June 30 1985 the intention to purchase 12 of the new version of the 737, the 300 series. The 300 series introduced new and more fuel efficient engines and new CRT equipment of which TAA was the launch customer for this series. 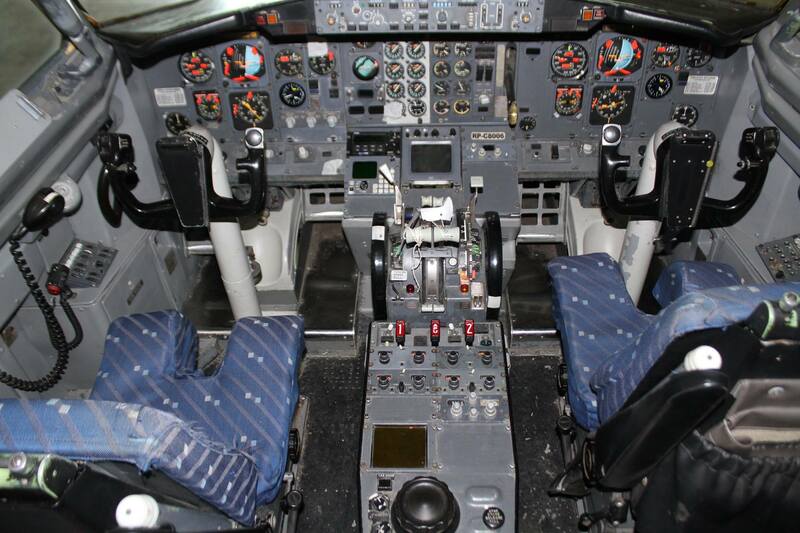 The 300 series was also 35% better in fuel efficiency than the then in service DC-9 and 727. As mentioned before, it was introduced to TAA service. A new livery was introduced with the first delivery of the 737-376 and with it came a name change to Australian Airlines. VH-TAF was revealed to the public along with the new livery at Seattle on June 8 1986. Australian Airlines was to take delivery of 11 more 737-376s as was Ansett which quickly ordered and took delivery of their 737-377 which replaced the previous 277 series. Ansett eventually took delivery of 24 377s and Australian 16. Australian also took delivery of 15 737-476s as well. The 400 series was an evolution of the 300 with a 168cm fuselage extension forward of the over wing exit, an extra over wing exit and an aft stretch of 122cm and a ventral tailskid fairing. As time went on Boeing realised that the 737 airframe still had more to give and a ‘New Generation’ of airframes was launched in 1993 with four new models the 600, 700, 800 and later the 900 version. Today the 737 is flown by both QANTAS and Virgin Australia. QANTAS has a very large fleet with the 75th aircraft delivered and fittingly the aircraft was painted in the Ochre 1970’s livery and appropriately named James Strong after the long serving CEO of both Australian and QANTAS. Virgin Australia also has a large fleet of 737s with 72 800’s and two 700’s in their fleet. Virgin has re-affirmed their commitment to the 737 with an order for 23 of the latest version of the 737 the MAX-8 which was launched in September 2011. As recently as August 2015 Virgin Australia bolstered this order to 40 aircraft. The 737 has also appeared in a couple of other operators in Australia including Virgin Blue, National Jet, Elders IXL, Australian Air Express, Heavylift, Ozjet, NorfolkAir and the Royal Australian Air Force in both the Boeing Business Jet (BBJ) and E-7A Wedgetail Airborne Warning and Control System (AWACS). An exciting new display will arrive at Moorabbin Airport today a bit lower, a bit shorter and a lot slower then it previously would arrive at an airport. 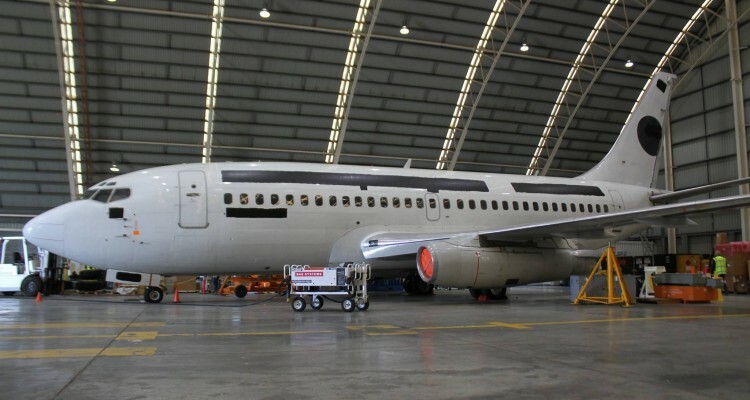 The Australian National Aviation Museum are pleased to announce a new display the forward fuselage of a Boeing 737-2B7 and one of its JT8D-15 Engines to join the large array of aircraft and engines on display at the museum presently. The Australian National Aviation Museum was formed in 1962 by a group of members of the Aviation Historical Society of Australia who sought to preserve Australia’s Aviation History. The collection grew very quickly and today holds a collection of airframes numbering over 65 different types. 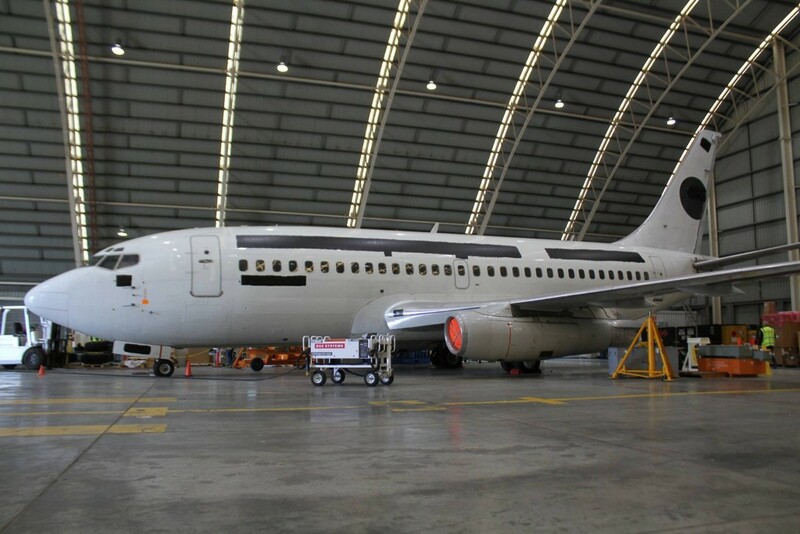 The 737 will be able to showcase to visitors the development of air travel as it is today. • 6/11/2008 purchased by Skills Victoria for the use of Kangan Batman Tafe the aircraft arrived at Tullamarine airport at 18:00 hours.